Bill gates has been in a car accident. He finds himself in purgatory, being sized up by St. Peter. “Well, Bill, I’m really confused on this call. I’m not sure where to send you. After all, you helped society enormously by putting a computer in almost every home in America, yet you also created that ghastly Windows ’95. I’m going to do something I’ve never done before. In your case, I’m going to let you decide whether you want to go to Heaven or Hell.”Bill replied, “Well, what’s the difference between the two?”St. Peter: “I’m willing to let you visit both places briefly, if it will help your decision.”Bill: “Fine, but where should I go first?”St. Peter: “I’ll leave that up to you.””Okay then,” said Bill, “Let’s try Hell first.”So Bill went to Hell. It was a beautiful, clean, sandy beach with clear waters and lots of bikini-clad women running around, playing in the water, laughing, and frolicking about. The sun was shining, the temperature was perfect. Bill was very pleased.”This is great!” he told St. Peter. “If this is hell, I really want to see heaven!””Fine,” said St. Peter, and off they went.Heaven was a place high in the clouds, with angels drifting about, playing harps and singing. It was nice, but not as enticing as Hell. Bill thought for a minute, and rendered his decision.”Hmmm. 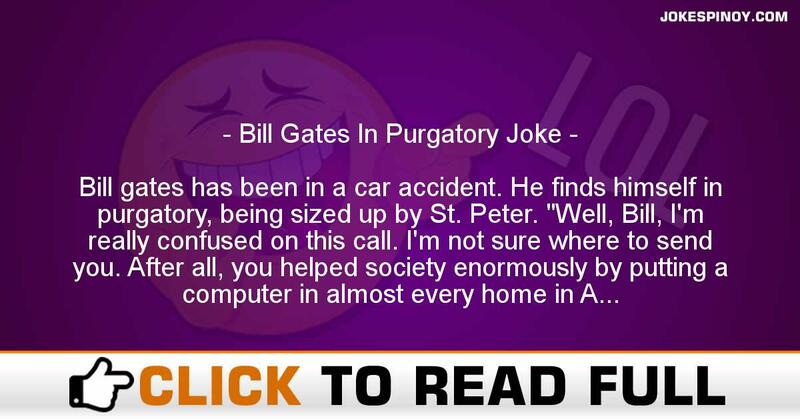 I think I’d prefer Hell,” he told St. Peter.”Fine,” retorted St. Peter, “as you desire.” So Bill Gates went to Hell.Two weeks later, St. Peter decided to check on the late billionaire to see how he was doing in Hell. When he got there, he found Bill, shackled to a wall, screaming amongst hot flames in dark caves, being burned and tortured by demons. “How’s everything going?” he asked Bill.Bill responded, with his voice filled with anguish and disappointment, “This is awful! This is nothing like the Hell I visited two weeks ago! I can’t believe this is happening! What happened to that other place, with the beautiful beaches, the scantily-clad women playing in the water?” “That was a demo,” replied St. Peter. ABOUT US : Laughter is the very best medicine as the old saying says, we at JokesPinoy.com will give you all the humorous filipino quotations and photos in tagalog language. Back in 2013, a group of Filipino OFW (Overseas Filipino Worker) got bored and they make an effort to look for some humorous quotes on the net simply to have fun but sadly most of the websites they found on that time are having an old jokes and have no interaction with the users. From that moment, they then got an idea to build their very own jokes website and let other users to give their jokes or opinion with the present jokes. Following the funds and concepts accumulated, JokesPinoy.com was born, a website that let the user share their jokes and let them have dialogue with other users as well. Since the website has been launch, tens of thousands of visitors are coming each day to read jokes and have fun on the website and too as giving their view on the jokes they read. We hope from JokesPinoy.com that this website may provide you some smile and happiness, Life is Short so have fun on it. DISCLAIMER: Some of the jokes, pictures and videos seen in this site are not created by us, they can be made by our users or they simply get it somewhere in the web just like 9gag, youtube, metacafe, vimio and etc. We regard copyright info which is posted here including funny pictures and humorous videos. If encase there are files posted here in our site which is owned by your and you don't want to share it to anybody afterward fell free to contact us to remove it. Majority of the language used on this site was in tagalog and some are bisaya that are both filipino language which originated from Philippines, if you want to interpret the joke to english you can used an online translator to interpret it from tagalog to english.